Method: Shake all the ingredients with ice. Strain over ice in tall glass. Method: Fill a highball glass with cubed ice. Add the Tofka and top up with the ginger beer. Add a squeeze of lime and garnish. 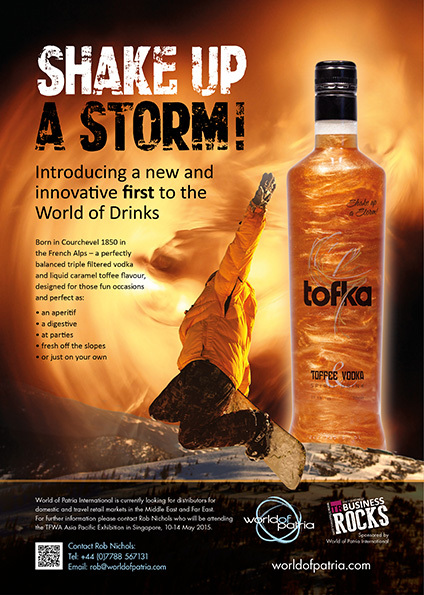 Method: Pour the Tofka and Dark Rum into a sling glass over crushed ice. Squeeze in the lime and top up with the ginger beer. Method: Add the Tofka to a flute glass and top up with Champagne. Method: Shake all ingredients with cubed ice and add to a slog glass. Method: Shake all the ingredients together and serve over ice. Method: Shake all ingredients hard with cubes ice. Strain into a sling or latte glass and garnish with the whipped cream and chocolate powder. Method: Mix all the ingredients together and pour into a martini glass. Add the melted chocolate to create a marble effect. Method: Pour the Tofka and Malibu over crushed ice in a highball glass. Top up with Pineapple juice and a squeeze of lime. Method: Shake all ingredients hard and double strain into a martini glass. Method: Pour all ingredients into a rocks glass over some ice cubes. Garnish with orange peel.